A deadly virus released in 1996 wipes out almost all of humanity, forcing remaining survivors to live underground. 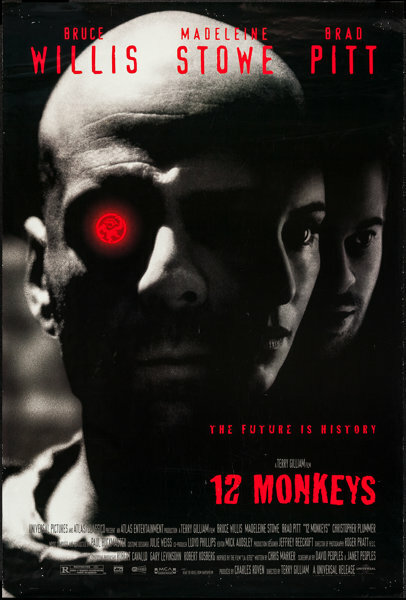 A group known as the Army of the Twelve Monkeys is believed to be behind the release of the virus. In 2035, James Cole (Willis) is a prisoner living in a subterranean compound beneath the ruins of Philadelphia. Cole is selected for a mission, where he is trained and sent back in time to locate the original virus in order to help scientists develop a cure. Meanwhile, Cole is troubled by recurring dreams involving a foot chase and an airport shooting. Read more on Wikipedia.